With each release Salesforce blogs, tweets, and sends smoke signals about important dates. That’s super helpful, but I need that info integrated into my work world. So, I created a Google Calendar for the dates! I can’t promise I’ll keep at it for every release, but I sure hope to! Feel free to add this to your Google world! Panic about being picked. Vacillate between being honored and horrified. Now all you have to do is take your topic and fill the time allotted with engaging and informative stuff. You may know your topic like the back of your hand, but you’ll still worry that no one else will find it interesting. Meet with your team. You’ll have at least one other person working with you on the session. Either co-presenters or Salesforce staff are there to help with gathering materials, reviewing slides, attending dry runs, etc. You will talk to these folks more than co-workers, family, and friends for the next few weeks. Keep in mind these folks aren’t all in your timezone. The eternal dance of “when can you meet?” has begun. Oh, and GoToMeeting will crash at least once during at least one of these meetings. It will happen. Just accept it. Figure out who’s going to talk about what. This is pretty easy if you’re the only one on stage but it gets exponentially harder the more people you add to the mix. Negotiations can get tense. Begin the slides. I think we can all agree that collaborating on a PowerPoint file is evil. There I said it. EVIL! Who has the most recent version? Can’t we just use Google Docs? If we do, what happens when we try to get the slides into the template? This step also means that you have to flesh out your idea in a visually appealing form. You are tasked with making abstract concepts like “fields” and “setup audit trail” into images, because no one (ever) wants to look at a bunch of text on slides. Meet with the team again. Now you’re moving along! The PowerPoint deck is starting to have some meat to it. Folks are carving up the presentation into who’s gonna say what. You’re cruising! Dry Run #1. Your team meets with one or more Salesforce employees to to a rehearsal of the slide deck. You will be either waaaay under or waaaay over the time allotted to you. You get feedback. Tweak the slides. Now is the time when you start to really panic. There is so much to do and you have a day job, family, a life! When will it all get done? Never mind that you might have to make fake data to show a graph. The Excel RAND() function and DataLoader become your best friends. Dry Run #2. Better. It’s better this time. The team is transitioning between slides well. The visuals you’ve picked are interesting. No one hates anyone. You breathe a sigh of relief. The feedback is good. You’re firing on all cylinders. Just a few more things to fix and you’ll be ready to turn in the slides. More tweaks. Last minute review, one more logo, a better head-shot, do we need a comma there? Someone has to take the slides and put them in the official Dreamforce template. Slides get turned in just under the wire. You made it! You breathe. You breathe again. Whew! Now all you have to do is get to San Fran, find the venue, and don’t forget your banjo! This year I’m only presenting 3 sessions. So, take those steps and multiply by 3. I’m pretty sure my husband is still speaking to me…but then again, I haven’t seen him in a few weeks. Dreamforce is coming up very soon! I need to pack weather appropriate clothes, but the forecasts don’t reach that far into the future. Also, I’m a fan of charts and graphs (shocker!). What tool could I use to get the info I need? Enter Wunderground Trip Planner! This tool allows me to specify a date range and an activity. I picked Walking because, well, I always do a lot of walking at Dreamforce. Check it out here. Now I know, at least on average, what I can expect. Yeah internet! Yep, this is me. No, I have not started packing…yet. 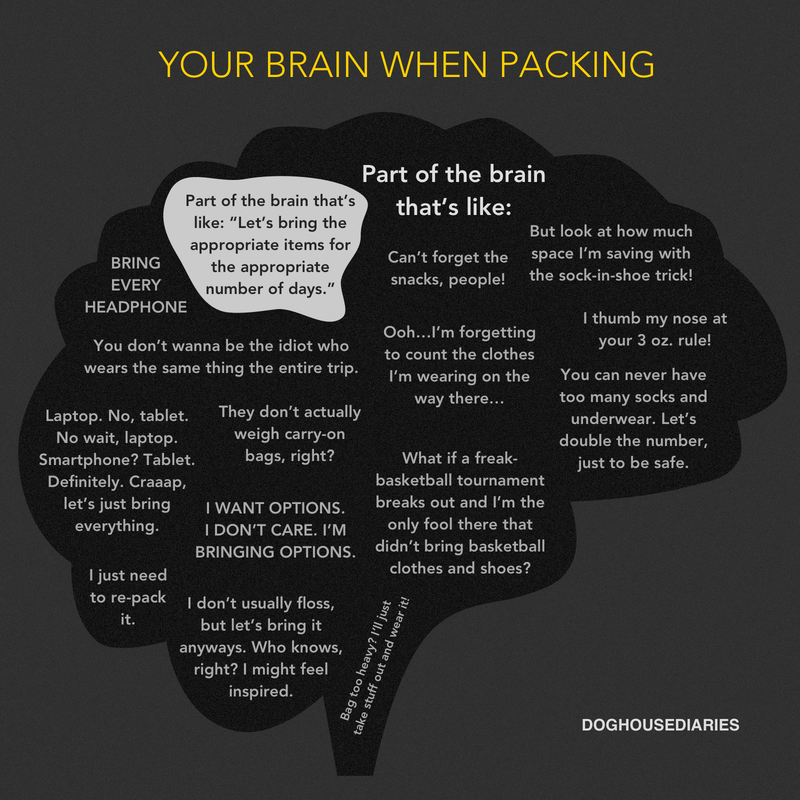 Image first appeared on DOGHOUSE | Your Brain On Travel. Later this year, Durham Tech is offering a class called Salesforce.com for Administrators. The class will be 5 Mondays in November and December 9am – 5pm. This course is substantially less expensive than most other Salesforce Admin courses and will be taught locally (Durham). Whether you are a new Salesforce® system administrator or have been managing Salesforce for some time, you probably realize that a big part of the job is receiving and acting on requests from management or other Salesforce users to modify the system to meet the needs of the users and the company. The nature of Salesforce is such that there are almost always several ways to accomplish these types of modifications, so how will you know that you’re taking the right approach and really providing the support that is needed? By completing this course, you will identify information about the five native business processes every company can manage using Salesforce, regardless of the License Edition. You will also gain insight into each of the functional groups of users (Inside Sales, Outside Sales, Marketing, Customer Support, and Management), and you will establish patterns of critical thinking that can help you to ensure that you are indeed taking the right approach and providing the necessary support for each request you receive. Ultimately, completing this course enables you to be a vital resource for knowing how to configure the system in a manner that also allows the extraction of intelligence needed to measure and improve the company’s key performance indicators. MidWest Dreamin’ 2014 was a blast! The folks who organized (and I won’t try to name them all), did an amazing job! This regional user group pulled in over 400 (paid!) attendees! Amazing! First, I want to mention the awesome sponsors of the event! Without these folks, this event would not have happened. When you get the chance, thank these folks for being a part of this amazing community! SpringCM hosted a welcome party at their offices. Connections were made, friends caught up, and I may have tested out SpringCM’s awesome bean bag chairs. Thanks to the SpringCM folks for hosting us! The event kicked off with a keynote from Peter Coffee entitled “No Services, No Silos”. As always, Peter’s talk provided food for thought. We live in connected customer world now folks. How will your organization address the needs of your customers? How will you compete? After a short break, the sessions started. All told there were 20 sessions with a break for lunch. they covered everything from Admin tips and tricks, to Visual Flow, to change management. There was something for everyone. (Yes, I presented. Yes, it was awesome. Yes, I can’t wait to be invited back again next year!) The content for every session is available in the Success Community. A quick note about lunch: Yummy!! While the sessions were happening the Expo floor was open. There was quite a bit of traffic and the sponsors I spoke to were pleased with the interest. Lots of cool swag was given away and several folks took advantage of the “Ask an Expert” booth manned by community members. Once the official events were over, the dinners, parties, and general merriment started. A good time was had by all! The #MWD14 organizers deserve a nap, a raise, a beverage, a hug and BIG GIANT KUDOS for all their hard work. Bravo folks! Well done! Here are all the Ideas that were included in this release! Some awesome stuff in there folks! My personal favorite is the increase in Case attachment size (well, all attachments, but Cases are near and dear to my heart)! The old limit was 5mb and the new is 5x that! That’s 25mb for each! See page 29 of the release notes for more information. This year I’m speaking at a total of 5 session! Eeek! Come see me! When starting out or restarting a salesforce.com deployment, there are many questions, and many people making requirements for the tool. Using examples and discussion, join us as Brad Gross, President of Information Logistics and a Salesforce MVP, demonstrates the five most important questions that should be asked for every requirement and request. Have you heard about Analytic Snapshots, but been intimidated about setting your first one up? Or, are you simply unsure of how you can use them? Join us as we show you how setting up a snapshot can be as simple as performing three easy steps. Several use cases that virtually every organization can take advantage of will be discussed, such as tracking user logins over time, measuring Chatter adoption, reporting on changes to key fields, and more! Step-by-step instructions for setting up your own snapshots will be available so you can put what you learn into practice immediately. Salesforce admins are not created equal! Join us to hear from some of the best of the breed and steal their top tips that got them there. These super stars will fire off as many tips and tricks as possible. Salesforce professionals are here to stay!